The Three Day Racing School is every driver’s gateway to motorsports and racing. This is Skip Barber Racing School’s signature product – with a curriculum that combines classroom sessions with practical hands on seat time. The Three Day Racing School is a prerequisite for racers interested in obtaining a club, professional or international racing license. In this unique program, students master the fundamentals of racing in classroom and driving sessions. 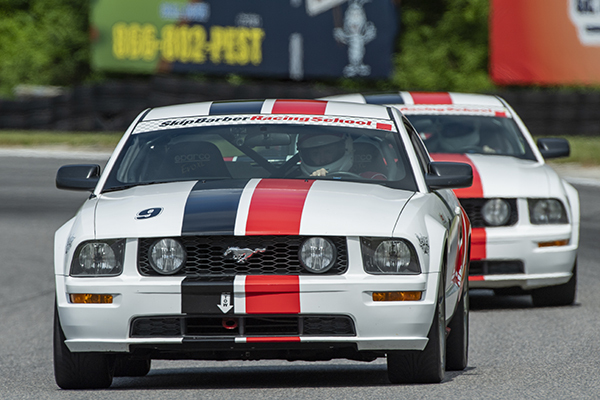 The cars used in the program are our race prepared Mustang GT School Cars. The School Car has braking and cornering capabilities that vastly exceed any street or sports car. In the morning, students will spend some time in the classroom and then out on the autocross course where Skip Barber instructors teach the group how to operate the racecar in preparation for on-track training. Students then review the proper racing line, race style downshifting, threshold braking, and cornering techniques. All of these exercises are important in helping the racer find their “limit” inside the race car and discovering the car’s true capability. After lunch, a downshift talk and exercise takes place before turning the first on track laps of the school in lead-follow sessions. On the second day, there is a substantial amount of time spent on stop box lapping sessions while getting instant feedback in the race car. Stop box lapping gets the racer as comfortable as possible in the car with extensive repetition, feedback and progression lap after lap. Students will also do additional braking exercises and learn to read the various racing competition flags used worldwide. After lunch, students have a brake and tech talk before an intense exercise of proper braking techniques. The last day of the school incorporates racecraft. The student puts everything that they have learned to the test. Students will practice real racing starts and restarts, complete several passing and drafting exercises, and get plenty of open lapping sessions. Prerequisites: Driver must be 16 years old or have an approved karting background. Karting backgrounds will be approved by the chief instructor. Drivers must be proficient with a manual transmission. Drivers under 18 must have a parental consent form and waiver signed. Graduates of the Three Day School can always do more! What’s next? The 2 Day Advanced Racing School is the best next step!